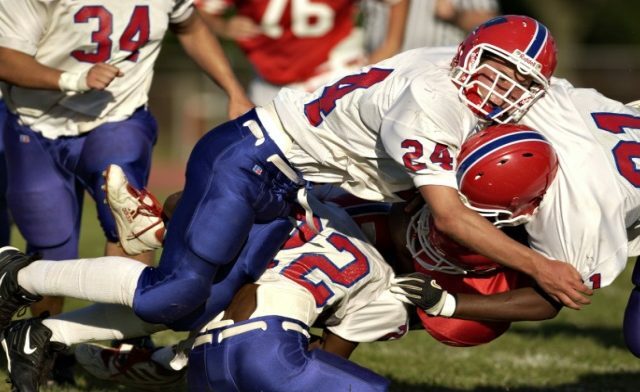 HealthDay News — Boys who start playing tackle football before the age of 12 may face a higher risk for cognitive deficits as adults, according to research published in Neurology. In 2011, investigators recruited former National Football League (NFL) players to participate in an ongoing study called DETECT. The players’ average age was 52, and all had played at least two years in the NFL and 12 years of “organized football.” All had sustained a comparable number of concussions throughout their careers. All had a minimum six-month history of mental health complaints, including problems with thinking clearly, behavior, and mood. All underwent a standardized battery of neurological testing to assess learning, reading, and verbal capacities, as well as memory and planning skills. All the players performed below average on several of the assessments. But by many measures, the overall mental functioning of those who started playing before age 12 registered roughly 20% below that of those who started at age 12 and older. For example, the early start group performed worse in terms of immediate and delayed verbal-recall tests, and were deemed less mentally “flexible” than the 12-and-up group. The study authors pointed out that, on average, children who play football between the ages of 9 and 12 experience between 240 and 585 head hits per season, with a force that is comparable to that experienced by high school and college players. Stamm J et al. Neurology. 2015; doi:10.1212/WNL.0000000000001358. Concussion Detection: The Most Serious Decision in Sports?